Designed for high efficiency lunch box sealing packaging operations. 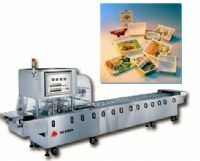 This machine is excellent for high production demands in lunch box packaging. 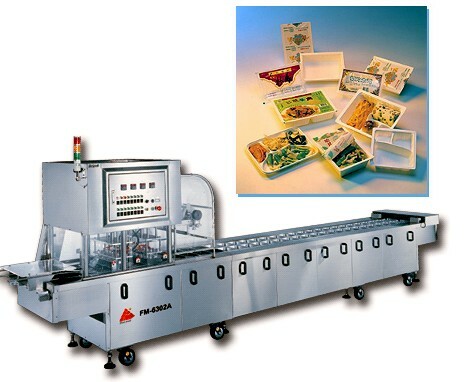 The lunch box sealing, cutting, and products outfeed are automatically performed. The filling is manually operated. Lunch box, fresh or frozen food, etc. * Equipped with an imported, high performance frequency, inverter. The operation speed is LEO displayed. * High production speed greatly reduces labor cost. * In dependent temperature control on each mold. The lamp lights up if there is a malfunction, in the heating system. * Stainless steel sealing knives ensure rust free performance.